Berkeley, CA â€“ 17 November 2011 â€“ Brandon Seifert and Lukas Ketner’s WITCH DOCTOR miniseries was one of the best-received original miniseries of 2011 â€“ but they’re not stopping there! In fact, in addition to the upcoming WITCH DOCTOR: THE RESUSCITATION one-shot, the exploits of Seifert and Ketner’s Dr. Vincent Morrow is getting the trade paperback treatment courtesy of Image Comics and Robert Kirkman’s Skybound imprint! The WITCH DOCTOR, VOL. 1: UNDER THE KNIFE TP will include the first four issues of the fan-favorite WITCH DOCTOR series, plus zero issue originally publishing as a flip-book with THE WALKING DEAD #85, and an introduction from Robert Kirkman. The WITCH DOCTOR, the sardonic Dr. Morrow, is looking for a vaccine… for the apocalypse! In his quest to understand the biology of the supernatural, he faces vampires, demonic possession, faeries and more! WITCH DOCTOR, VOL. 1: UNDER THE KNIFE TP (OCT110522, ISBN: 978-1-60706-441-1), a 112-page full-color medical horror trade paperback for $12.99, will be on sale in stores and digital platforms on December 14. 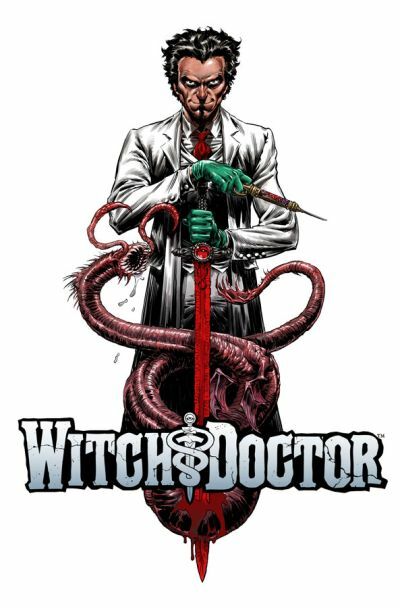 WITCH DOCTOR: THE RESUSCITATION (OCT110447), a 32-page full-color one-shot for $2.99, will be on sale December 21.